If you think that population density is important for political and economic outcomes (I do), this development could be pretty revolutionary. I'd be interested though to know how much of this density is due to Nigeria, South Africa, Ethiopia, and the East African Community, and how the other 40 or so countries fare. I also think that this is a really big deal, and I'm glad that someone else found it surprising and interesting. 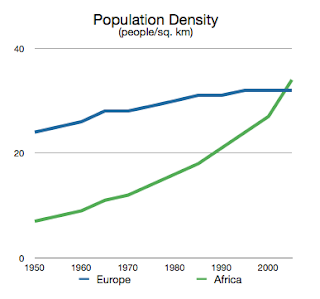 I'm going to try to make an animated, shaded map of Africa to show pop density changes across countries from 1950-2010. On the positive side, cities allow for much more efficient markets and social linkages, and are probably less resource intense in some ways (e.g. transportation fuel). On the negative side, poverty and unemployment can be particularly explosive in urban settings, and the urban poor are more vulnerable to higher food prices, which may be here to stay.